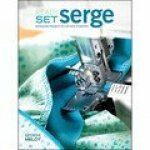 Ready, Set, Serge presents a basic introduction to the serger and 15 quick and easy projects. Each of the 15 projects includes a variation incorporating more advanced techniques for a total of 30 projects. Novice sewers will discover serging success in a minimal amount of time and experienced sewers will find quick gift ideas.